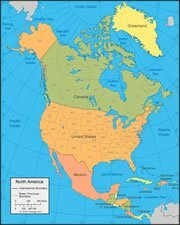 This is a political map of North America which shows the countries of North America along with capital cities, major cities, islands, oceans, seas, and gulfs. The map is a portion of a larger world map created by the Central Intelligence Agency using Robinson Projection. You can also view the full pan-and-zoom CIA World Map as a PDF document. Google Earth is a free program from Google that allows you to explore satellite images showing the cities and landscapes of North America and the rest of the world in fantastic detail. It works on your desktop computer, tablet, or mobile phone. The images in many areas are detailed enough that you can see houses, vehicles and even people on a city street. Google Earth is free and easy-to-use. North America is one of 7 continents illustrated on our Blue Ocean Laminated Map of the World. This map shows a combination of political and physical features. It includes country boundaries, major cities, major mountains in shaded relief, ocean depth in blue color gradient, along with many other features. This is a great map for students, schools, offices and anywhere that a nice map of the world is needed for education, display or decor. 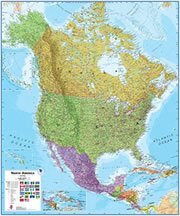 If you are interested in the geography of North America, our large laminated map of North America might be just what you need. It is a large political map of North America that also shows many of the continent's physical features in color or shaded relief. Major lakes, rivers, cities, roads, country boundaries, coastlines and surrounding islands are all shown on the map. The geographic continent of North America includes the countries of Central America, Mexico, the United States, Canada, Greenland, and the islands of the Caribbean region. This political map (shown at the top of this page) presents North America and its surrounding bodies of water in an equidistant azimuthal projection. State and province boundaries are provided in the United States and Canada, respectively. This illustration is a composite satellite view of North America presented as an orthographic projection centered at 40 degrees north latitude and 95 degrees west longitude. It was created in 2002 as part of NASA's "Blue Marble" series. It is a reprojected and cropped portion of the most detailed true-color image of the entire Earth that had been created at that time. Creators of the Blue Marble images stitched together months of satellite-based views of Earth until they came up with a nearly cloud-free, true-color mosaic. Most of the data used to prepare this image came from NASA's Moderate Resolution Imaging Spectroradiometer which was flying at an altitude of over 700 kilometers above Earth's surface onboard the Terra Satellite between June and September 2001. Topographic shading was added using the GTOPO30 elevation data set compiled by the United States Geological Survey. You can learn more about this image and obtain higher resolution copies at other projections from NASA's Visible Earth catalog. 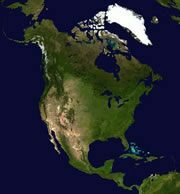 North America is a continent north of South America, between the Atlantic Ocean and the Pacific Ocean. Copyright information: The images on this page were composed by Angela King and Brad Cole and are copyright by Geology.com © 2008. These images are not available for use beyond our websites. If you would like to share them with others please link to this page. The satellite image was produced using data from NASA and the map was produced using data licensed from and copyright by Map Resources © 2008.